Avalon Chronicles book two is fully arted! Pencilled and inked by me, with beautiful tones from Nana Li, and of course script from Nunzio DeFilippis and Christina Weir (with additional story from me). I can’t wait to see it all lettered up! Next stop: Vampire Academy - Shadowkiss! So, I came home from Italy (where I managed to catch up with family I really don't see enough) to find news online that Frostbite is out in the world! Some of the world :) Australia and New Zealand, you have the first sightings, it seems! I'm already seeing some positive comments from readers and am just thrilled that you guys are enjoying the book. ^__^ If you're in the US, I'm afraid the release date will be on the 24th May, so just a little longer to wait, but the book is available for pre-order from all good stockists. If you're in the UK, I am making efforts to have copies of the book at Kapow, MCM and 2D, but only in very limited supply, I'm afraid. I'll be at the Sweatdrop stand for MCM all weekend, and am signing at Kapow from 13:30 on the Sunday, following a panel on independent comics at 12:45. If you're attending one of those events and want to reserve a copy, drop me a line by email or over on twitter (@emmavieceli). Otherwise, the trusty internet will of course provide. How did we survive without online shopping, eh? In other book news, Avalon Chronicles is also doing its thing and I'm so happy to see people enjoying it. I'm working on book two of the series right now, and hooo boy it's going to be fun! Some brilliant new characters and lots of surprises in store for our heroes ^_^ You should be able to get Avalon part one from all good bookshops, but you can of course also order it online or even pick it up on Comixology - where the panel-by-panel reading system works really well on portable platforms. I am very excited to announce that part one of the Avalon Chronicles will be released this very month from Oni Press! Together with writers Nunzio Defilippis and Christina Weir, and lovely editor Jill Beaton, I am very chuffed that the book will soon be out in the world, in pretty hard cover format, no less! Already available for pre-order from bookshops and online. I've added the cover design that Penguin put together to the character gallery, so you can at least see that, woot! I've also put in the promo artwork I created for Avalon Chronicles: Once in a Blue Moon. I don't have much at all to do now on book one of my Oni series, written by Nunzio DeFilippis and Christina Weir, but we're still planning relelase schedules, so it's on a slight backburner until Vampire Academy is wound up. I can't wait to see Avalon out there though; it'll be worth the wait! Okay, so – though I wasn’t at San Diego Comic Con in person, I was there in spirit in the form of some very exciting announcements that I’ve been wanting to share for a long time. 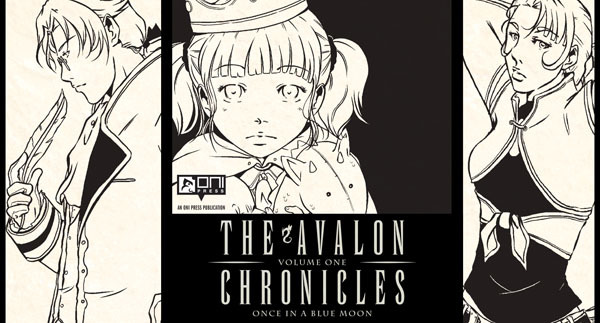 Firstly, I will be working with writers Nunzio DeFilippis and Christina Weir, and the lovely folks at Oni Press, on the series - Avalon Chronicles. Hugely exciting! Nunzio and Christina are just wonderful, and I’m so honoured to not only be drawing their epic, but also to be allowed to join in on some of the story creation! I can’t wait to share some of the cast and progress work with you. For now, you can check N & C’s blog for more details, and I can offer up the sample preview I put together for San Diego’s announcement at the Oni panel. Aaand - Richelle Mead is the fabulous writer responsible for the rather schmexy Vampire Academy series of novels, and I am just utterly thrilled to be the artist responsible for bringing her story to life in graphic novel form, to be published by Penguin Books. Getting to work on such a popular (and bloody awesome) series is exciting enough, but to be working for a giant like Penguin Books makes me feel very privileged. You can see Richelle’s own post at her blog, along with the cover mockup that Penguin have put together for the announcement, by clicking on the banner. So – it’s an exciting time for me and I am more hyped than I can say! I’m already mid production on the first Avalon book, Once In a Blue Moon (a re-imagining of the same title released several years ago), and am eagerly awaiting Leigh Dragoon’s script for Vampire Academy – though I’ve played with test pages enough to know I’m going to very much enjoy these characters!